upon it's arrival from a long day of travel. Howie Borrow, one of five Keepers of the Cup, was prepared for duty, heading to Dunnville, Ontario with the Stanley Cup on Friday, July 15 to spend the day with Bruins' star, Nathan Horton. At 9:30, he arrived at Buffalo Niagara International Airport and was greeted by Tammy and Nathan Horton. Nathan had just completed his sixth NHL season — his first with the Bruins after spending five seasons with the Panthers in Florida — and was a key component of this spring's Stanley Cup win. 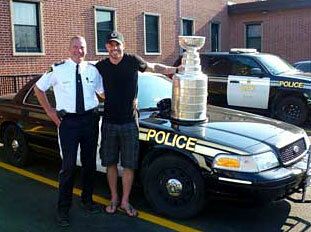 The Hortons had big plans for the Stanley Cup on their day in Dunnville, Ontario. The three waited for the Stanley Cup to arrive with the oversized luggage, but unfortunately, it hadn't made it through check-in and security in time and missed the flight! 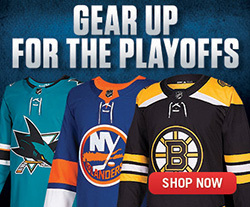 The Stanley Cup was still in Boston! 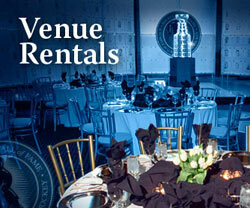 enjoy a drink from the Stanley Cup. Nathan, ever the gentleman, was understanding. "Listen, you wait here for the Cup, Howie. Me and Tammy will head to Dunnville because there's a parade at 11:00. Just get to us as soon as you can. Everything's cool." Well ... everything was cool except for Howie, who was more anxious than a long-tailed cat in a room full of rocking chairs. Assured that the case with the Stanley Cup would be on the next flight, Howie fidgeted and paced, unable to relax until he saw the distinctive blue case arrive. Nathan and Tammy, with son Dylan, explained to the parade organizers that the Stanley Cup had not arrived. The decision was made to delay the parade by an hour, but should the Cup not be in Dunnville by then, the parade would go ahead, as hundreds of fans had already lined the streets in anticipation of seeing local hero Nathan Horton with the Stanley Cup. With Howie Borrow waiting in the airport in Buffalo, the Stanley Cup parade in Dunnville began  without the Stanley Cup  around noon. Nathan waved to the fans, greeting some old friends by name, as he and his family were driven through the picturesque streets. About this time, the next plane from Boston arrived with the Stanley Cup. Borrow, his chest heaving in relief, grabbed the case, peeked inside to make certain the trophy was inside, and then hailed a taxi to take him from Buffalo to Dunnville. This is not a quick trip. From Buffalo, the cab crossed the border into Canada, driving through Fort Erie and passing Stevensville, Welland and Wainfleet before arriving in Dunnville. With Howie squirming as the meter ticked, the driver was smiling like the butcher's dog. An hour and 45 minutes later, the Stanley Cup was carried directly to the bandshell. The parade had ended some time before, and Nathan was waiting, along with hundreds of others, at the bandshell, knowing that the Cup's arrival was imminent. 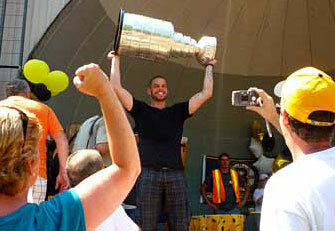 While some had to leave, the vast majority remained to see the actual Stanley Cup and their local hero, Nathan Horton. time at the Ontario Provincial Police dispatch. Nathan grabbed the gleaming silver trophy and hoisted it high over his head to a tumultuous cheer. Big smile intact, he walked over to the table and for the next 45 minutes, signed as many autographs as he could while pictures were taken of the Stanley Cup. Already running well behind schedule, Nathan politely thanked everyone for coming and, as he walked away with the Cup, was left with the sound of applause ringing in his ears. Nathan, Tammy and Dylan headed off to Nathan's mother's house. Georgina, who family and friends call 'George,' was so proud to see her boy with his family and the Stanley Cup. Pictures were taken, but the highlight was when Dylan kissed Lord Stanley's mug. Next on the agenda was a trip into Niagara Falls, Ontario to spend some time with Nathan's Dad. 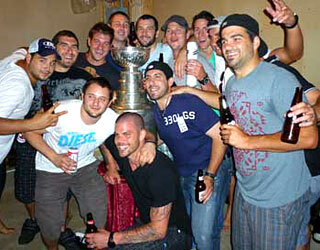 The Cup was placed in the backyard and family and friends spent some time celebrating with Nathan's big prize. Horton made a couple of quick stops. He spent 15 minutes at the Ontario Provincial Police dispatch office and then made time to visit a youngster going through cancer treatments. The final stop of the day was a backyard party at the home of one of Nathan's friends. There, guys he grew up with gathered to congratulate him on his career and the ultimate success of winning the Stanley Cup championship. The group of friends spent two hours outside and then another hour inside, reminiscing and catching up on each other's lives. Nathan was offered additional time with the Stanley Cup but declined. "Thank you, that's great, but it's been a long day, a great day and I'm just so happy to have been able to have the opportunity to celebrate with family, friends and fans." The Stanley Cup was again packed away ready for its next adventure. We won't tell you with whom, but Czech in with us on Tuesday to find out.